“Since 1997, Mannes-Abbott has been working on a series of prose poems, short stories and aphoristic texts he calls ‘e.things’, shorthand for ‘a thousand essential things’. 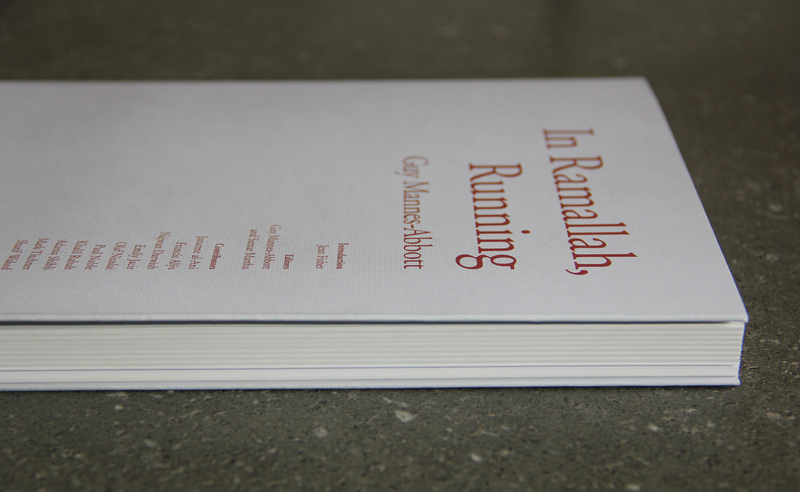 The latest is the centrepiece of his beautiful new book, titled In Ramallah, Running. 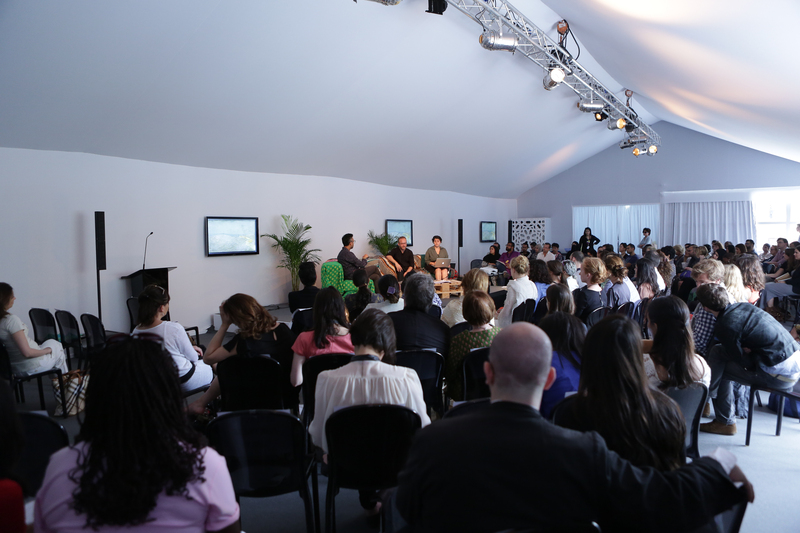 Mannes-Abbott was in Ramallah in the summer of 2010, as a writer-in-residence at the A.M. Qattan Foundation. To explore the hills of what he calls the ‘“as-if” capital of an “as if” statelet’ and perhaps more importantly to test out the city’s limits – of movement, imagination, making sense – Mannes-Abbott took to running (and occasionally walking) to the bewilderment, delight and suspicion of almost everyone he met. SB: How did you end up spending time in Ramallah, and why Ramallah in the first place? SB: What does this form of writing bring to you and to the reader, and can you tell us what an “e.thing” is? EI: How much was this an “artistic” project versus a “political” one? EI: You don’t write much about yourself, besides walking and running around the environs of Ramallah. Why did you choose to mostly leave yourself out of the project? Mannes-Abbott: I was trying to let the place speak itself, if that doesn’t sound faux-naive. I’m aware of obvious colonial legacies and practices and that I’m going and “recording” the place too! So motivation, method and a certain exactitude are crucial, no? That’s why I tried so hard to maintain this “outsiderness” in the writing. I did and do have close friends in and from Palestine, but when I arrived I just started walking, running, stumbling on my own, and for me that was essential. What I’ve written is true to that experience. SB: Did you know before you got to Ramallah that you would be running? GMA: … I wanted to attempt to locate and trace out two related spaces or locations in the place. That is, an interior and exterior circle formed in locations as ‘free’ as possible from Occupation presence.The former could be as simple as a backyard or garden, the everyday life and tending of which I would witness over time. A limited space but one free of the direct impacts of Occupation, in a sense. Then, I was hoping to attempt a wider circle exterior to the city that would also record only Palestinian life and the place itself, ‘free’ of Occupation or at least from obvious interdictions and infrastructure. 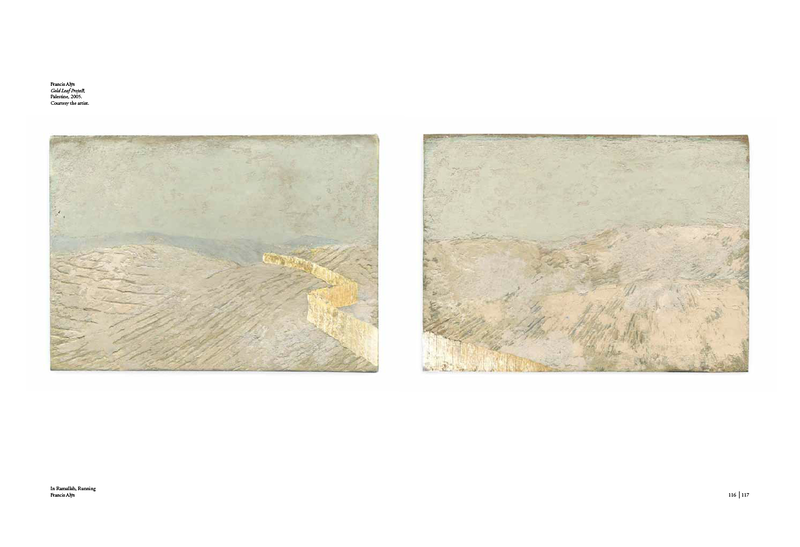 I wanted my text to record the place – a past and future Palestine – ‘liberated’ in these particular ways or senses. So running became my way of getting closest to – in fact expanding on – the first part of that, the interior of the city, the more interior intimate space and everyday relationships with the place. Walking on the outside was another expanded version of the other, a kind of circling or weaving through and in the place. SB: At one point you walk down Al Jihad (‘struggle’) Street in one direction, referring to yourself as a ‘bubbleburster’. This is the first instance where you use the street names to introduce concepts of what you are communicating. You test the limits of freedom and existence by going down Jihad Street, as if you are running a map theory, biography and political history all in one. GMA: That hones in on something quite complicated: it’s difficult to speak about because it was difficult to write about. There is an image that I steal from Haruki Murakami about marathon running and novel writing: that it is like breathing without taking a breath, this impossible paradox, which is exactly what it feels like in Ramallah. It is like resisting and being unable to resist at the same time, all the time, that kind of ricochet. This excerpt consists of five of the seven running texts in the book, with three photographs of mine not otherwise published, in an interesting issue that includes Joana Hadjithomas and Khalil Joreige on their Rocket Society, etc. Khalil and I were part of Adelaide Festival’s opening day in 2014. Click on the link and scroll down to this image above. This short audio excerpt comes from Shumon Basar and Charles Arsene-Henry’s Translated By project/book in its Manifesta manifestation… It’s performed here by Geoffrey Strietfeld for the original exhibition of TB , where it joined a special list of other writers/images/recordings at the Architectural Association, which generated another version in Japan (CCA) and yet another in Istanbul (SALT Galata). For the latter the expanded series of stories was translated and published in Turkish as Tercüme Eden (with Suna Kafadar). The full list in this translation combines those in the link above with this below along with Yasunari Kawabata.
. In Ramallah, Running book launch with reading and signing 7-9 Wed. 12.09.2012. Delfina Foundation London More info.
. In Ramallah, Running book launch with reading and panel of special guests; Jean Fisher, Jananne al-Ani, chaired by Sheyma Buali 7pm Thurs. 25.10.2012. The Mosaic Rooms London. More info.
. In Ramallah, Running book launch, reading and signing 6:30pm Wed. 11.10.2012. Ikon Gallery, Birmingham Book Festival. More info.
. In Ramallah, Running reading/talk w Sarah Irving and Leila Khaled 5:30pm Sat. 27.10.2012. Radical Book Fair, Edinburgh. More info.
. 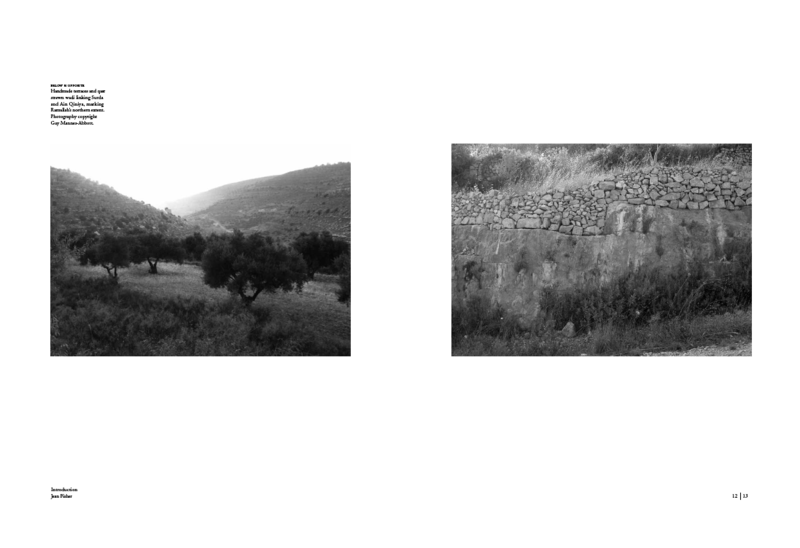 In Ramallah, Running reading at Veracity of Memory: Performing Field Recordings with Lawrence Abu Hamdan and Mark Peter Wright 5-8pm Sat 16.06.2012 at the Serpentine Gallery’s Centre for Possible Studies London. More Info: Veracity-of-memory-saturday-16-june-17-00-20-00-event-flyer.
. In Ramallah, Running reading and signing 1:30pm at New Walsall Art Gallery, Walsall (Salaam Festival).
. In Ramallah, Running reading and panel 3:30-6:30pm Fri 10.05.2013 Beyond the Former Middle East: Opening Dialogues with Lawrence Abu Hamdan, Sheyma Buali, Joana Hadjithomas, Khalil Joreige introduced/chaired by Omar Kholeif at the Whitechapel Gallery, London. More Info.
. In Ramallah, Running reading and talk 7-10pm Fri 17.01.2014 An Evening with GM-A at Contains Art, Watchet Harbour, Somerset. More Info.
. 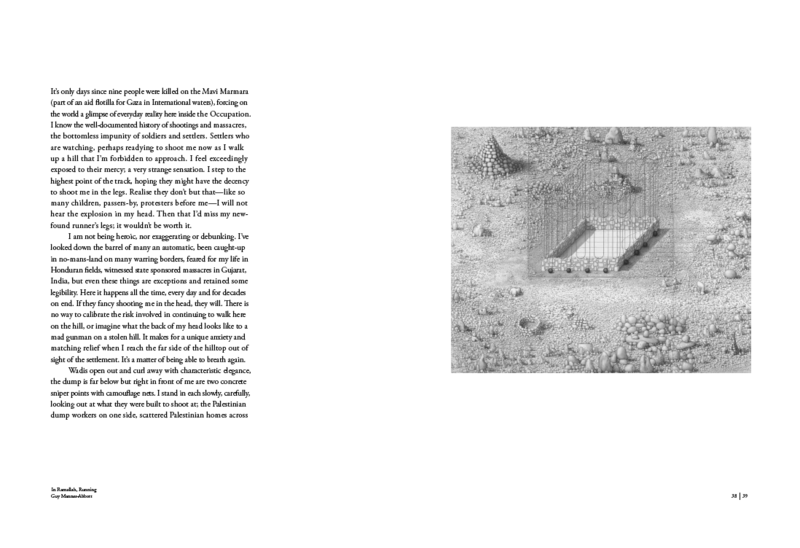 In Ramallah, Running reading and Q&A with Sary Zananiri 5-6pm Thur 06.03.2014, Galleries UNSW (Courtyard Gallery), Sydney. More Info.